Watch this video to learn more about energy efficient windows can help your home. Are the windows in your home outdated or drafty? If so, your windows are wasting energy and causing your home to have uncomfortable temperatures. Drafty windows allow the air you pay to heat and cool to escape your home while also letting outside air in, creating a number of home efficiency problems. At Woods Basement Systems, Inc., we can help you solve these problems in your home with energy efficient replacement window installation. Our windows are designed to provide the energy performance you need while offering a beautiful finished look. If you're interested in replacement windows for your home, call us today at 1-844-204-8198 or click below to get started with a free estimate in O' Fallon, Belleville, Florissant and the nearby areas. 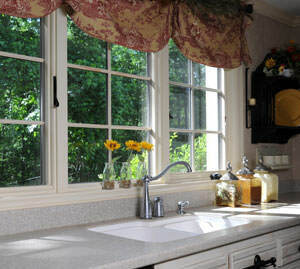 Replacement windows will improve appearance and energy performance. Energy savings: If you replace old, single-pane windows with ENERGY STAR® qualified replacement windows, you will be able to save money on heating and cooling costs by eliminating air loss and heat transfer. Curb appeal: Replacement windows are a great way to upgrade your home's appearance inside and out. You'll enjoy the look as long as you have them, and new windows will also add resale value to your home when the time comes to sell. Low maintenance: While old-fashioned wood windows required regular painting and even re-glazing, today's top-quality replacement windows are made from durable, maintenance-free vinyl or fiberglass. More security: Modern windows provide greater safety and better locking systems than outdated windows and hardware. Low-E glass: Clear glass in old windows allows heat from the sun to heat up your house in the summer, causing you to use electricity to run the AC. It also allows heat from inside in the winter to be lost to the outside. Low-E glass in a modern energy efficient window stops the flow of 60% of this heat. Low-E glass is slightly tinted, like sunglasses, by a metallic coating on the inside of the glass. Double pane glass helps heat losses too, and the space between it can be filled with argon gas, which doesn't transfer heat through the space like air will. Vinyl frames: Vinyl never needs paint and won't rot, chip or peel -- the perfect material for a window frame. The low maintenance of vinyl keeps it looking great forever and saves you the cost of repainting your frames. Lower U value means higher R-value: Great windows have a U value of .30 -- the lower the better! If you divide the U value into 1, you get the R-value. So a window with a U value of .3 will have an R-value of 3.33. It doesn't sound like a lot when compared with an R13 wall, but glass will always be the thermal weak spot in a wall no matter what you do. Compare this R-value of 3.33 with an old window that may have a U value of .8 -- which would be an R-value of 1.25 -- and you start to feel pretty good. Foam sealant around the window: The best replacement window in the world will leak air if it's surrounded by fiberglass. Fiberglass in a shim space is nothing more than an air filter. Windows must be sealed around with foam in the shim space to perform their best. If you're interested in improving your home's appearance, comfort, and efficiency with replacement windows, the local experts at Woods Basement Systems, Inc. are here to help. We can recommend the right windows for your home's design and energy needs and provide you with a quality installation. Call us today at 1-844-204-8198 or contact us online to get started with a free estimate in O' Fallon, Belleville, Florissant and the nearby areas.